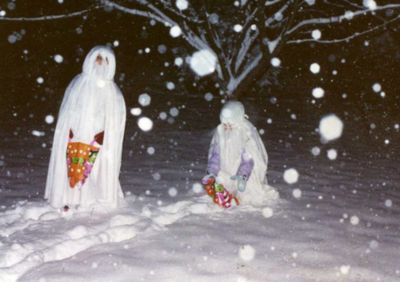 This is a picture of my sister and I dressed as ghosts during the infamous Halloween blizzard of ‘91 that resulted in 28” of snow. Fun fact: this picture was taken 4 days after the last time a Minnesota professional sports team won a national championship (Twins). "Fun fact: this picture was taken 4 days after the last time a Minnesota professional sports team won a national championship (Twins)." This year the Minnesota Lynx won the WNBA national championship, and the Minnesota Stars won the NASL (North American Soccer League) champsionship. Both are professional sports teams from Minnesota.